"Santa" redirects here. For Santa Claus, see Santa (disambiguation). This article is about the legendary character. For for the fourth-century Christian saint, see Saint Nicholas. For other uses, see Santa Claus (disambiguation). 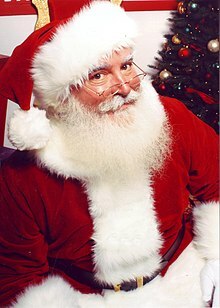 Santa Claus is generally depicted as a portly, jolly, white-bearded man—sometimes with spectacles—wearing a red coat with white fur collar and cuffs, white-fur-cuffed red trousers, a red hat with white fur and black leather belt and boots and who carries a bag full of gifts for children. This image became popular in the United States and Canada in the 19th century due to the significant influence of the 1823 poem "A Visit from St. Nicholas" and of caricaturist and political cartoonist Thomas Nast. This image has been maintained and reinforced through song, radio, television, children's books, films, and advertising. Santa Claus is said to make lists of children throughout the world, categorizing them according to their behavior ("good" and "bad", or "naughty" and "nice"), and to deliver presents, including toys and candy, to all of the well-behaved children in the world, and coal to all the misbehaved children, on the night of Christmas Eve. He accomplishes this feat with the aid of his elves, who make the toys in his workshop at the North Pole, and his flying reindeer, who pull his sleigh. He is commonly portrayed as living at the North Pole, and often laughing in a way that sounds like "ho ho ho". Saint Nicholas of Myra was a 4th-century Greek Christian bishop of Myra (now Demre) in Lycia. Nicholas was famous for his generous gifts to the poor, in particular presenting the three impoverished daughters of a pious Christian with dowries so that they would not have to become prostitutes. He was very religious from an early age and devoted his life entirely to Christianity. In continental Europe (more precisely the Netherlands, Belgium, Austria, the Czech Republic and Germany) he is usually portrayed as a bearded bishop in canonical robes. In 1087, while the Greek Christian inhabitants of Myra were subjugated by newly arrived Muslim Turkish conquerors, and soon after their Greek Orthodox church had been declared to be in schism by the Catholic church (1054 AD), a group of merchants from the Italian city of Bari removed the major bones of Nicholas's skeleton from his sarcophagus in the Greek church in Myra. Over the objection of the monks of Myra the sailors took the bones of St. Nicholas to Bari, where they are now enshrined in the Basilica di San Nicola. Sailors from Bari collected just half of Nicholas' skeleton, leaving all the minor fragments in the church sarcophagus. These were later taken by Venetian sailors during the First Crusade and placed in Venice, where a church to St. Nicholas, the patron of sailors, was built on the San Nicolò al Lido. St. Nicholas' vandalized sarcophagus can still be seen in the St. Nicholas Church in Myra. This tradition was confirmed in two important scientific investigations of the relics in Bari and Venice, which revealed that the relics in the two Italian cities belong to the same skeleton. Saint Nicholas was later claimed as a patron saint of many diverse groups, from archers, sailors, and children to pawnbrokers. He is also the patron saint of both Amsterdam and Moscow. During the Middle Ages, often on the evening before his name day of 6 December, children were bestowed gifts in his honour. This date was earlier than the original day of gifts for the children, which moved in the course of the Reformation and its opposition to the veneration of saints in many countries on the 24th and 25 December. The custom of gifting to children at Christmas has been propagated by Martin Luther as an alternative to the previous very popular gift custom on St. Nicholas, to focus the interest of the children to Christ instead of the veneration of saints. Martin Luther first suggested the Christkind as the bringer of gifts. But Nicholas remained popular as gifts bearer for the people. Father Christmas dates back as far as 16th century in England during the reign of Henry VIII, when he was pictured as a large man in green or scarlet robes lined with fur. He typified the spirit of good cheer at Christmas, bringing peace, joy, good food and wine and revelry. As England no longer kept the feast day of Saint Nicholas on 6 December, the Father Christmas celebration was moved to the 25th of December to coincide with Christmas Day. The Victorian revival of Christmas included Father Christmas as the emblem of 'good cheer'. 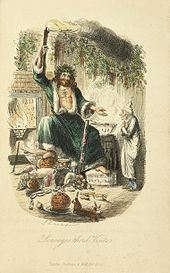 His physical appearance was variable, with one famous image being John Leech's illustration of the "Ghost of Christmas Present" in Charles Dickens's festive classic A Christmas Carol (1843), as a great genial man in a green coat lined with fur who takes Scrooge through the bustling streets of London on the current Christmas morning, sprinkling the essence of Christmas onto the happy populace. In the Netherlands and Belgium the character of Santa Claus has to compete with that of Sinterklaas, Santa's presumed progenitor. Santa Claus is known as de Kerstman in Dutch ("the Christmas man") and Père Noël ("Father Christmas") in French. But for children in the Netherlands Sinterklaas remains the predominant gift-giver in December; 36% of the Dutch only give presents on Sinterklaas evening or the day itself (December 6), whereas Christmas (December 25) is used by another 21% to give presents. Some 26% of the Dutch population gives presents on both days. In Belgium, Sinterklaas day presents are offered exclusively to children, whereas on Christmas Day, all ages may receive presents. 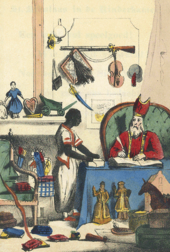 Sinterklaas' assistants are called "Zwarte Pieten" (in Dutch, "Père Fouettard" in French), so they are not elves. In Switzerland, Père Fouettard accompanies Père Noël in the French speaking region, while the sinister Schmutzli accompanies Samichlaus in the Swiss German region. Schmutzli carries a twig broom to spank the naughty children. Wodan's role during the Yuletide period has been theorized as having influenced concepts of St. Nicholas in a variety of facets, including his long white beard and his gray horse for nightly rides (compare Odin's horse Sleipnir) or his reindeer in North American tradition. 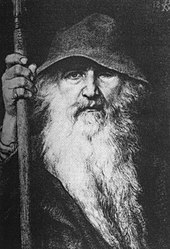 Folklorist Margaret Baker maintains that "the appearance of Santa Claus or Father Christmas, whose day is the 25th of December, owes much to Odin, the old blue-hooded, cloaked, white-bearded Giftbringer of the north, who rode the midwinter sky on his eight-footed steed Sleipnir, visiting his people with gifts. ... Odin, transformed into Father Christmas, then Santa Claus, prospered with St Nicholas and the Christchild, became a leading player on the Christmas stage." In Finland Santa Claus is called Joulupukki (direct translation 'Christmas Goat'). The flying reindeer could symbolize the use of fly agaric by Sámi shamans. 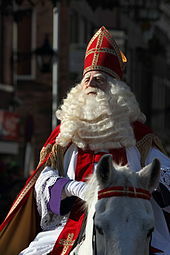 Early representations of the gift-giver from Church history and folklore, notably St Nicholas (known in Dutch as Sinterklaas), merged with the English character Father Christmas to create the character known to Americans and the rest of the English-speaking world as "Santa Claus" (a phonetic derivation of "Sinterklaas"). December 24, 1864. This has usually been a very busy day with me, preparing for Christmas not only for my own tables, but for gifts for my servants. Now how changed! No confectionary, cakes, or pies can I have. We are all sad; no loud, jovial laugh from our boys is heard. Christmas Eve, which has ever been gaily celebrated here, which has witnessed the popping of firecrackers ... and the hanging up of stockings, is an occasion now of sadness and gloom. I have nothing even to put in 8-year-old daughter Sadai's stocking, which hangs so invitingly for Santa Claus. How disappointed she will be in the morning, though I have explained to her why he cannot come. Poor children! Why must the innocent suffer with the guilty? –Diary of Dolly Lunt Burge - written during the latter part of the American Civil War. In 1821, the book A New-year's present, to the little ones from five to twelve was published in New York. It contained Old Santeclaus with Much Delight, an anonymous poem describing Santeclaus on a reindeer sleigh, bringing presents to children. 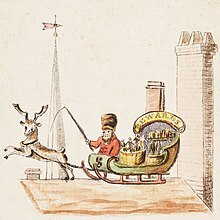 Some modern ideas of Santa Claus seemingly became canon after the anonymous publication of the poem "A Visit From St. Nicholas" (better known today as "The Night Before Christmas") in the Troy, New York, Sentinel on 23 December 1823; Clement Clarke Moore later claimed authorship, though some scholars argue that Henry Livingston, Jr. (who died nine years before Moore's claim) was the author. St. Nick is described as being "chubby and plump, a right jolly old elf" with "a little round belly", that "shook when he laughed like a bowlful of jelly", in spite of which the "miniature sleigh" and "tiny reindeer" still indicate that he is physically diminutive. The reindeer were also named: Dasher, Dancer, Prancer, Vixen, Comet, Cupid, Dunder and Blixem (Dunder and Blixem came from the old Dutch words for thunder and lightning, which were later changed to the more German sounding Donner and Blitzen). By 1845 "Kris Kringle" was a common variant of Santa in parts of the United States. A magazine article from 1853, describing American Christmas customs to British readers, refers to children hanging up their stockings on Christmas Eve for "a fabulous personage" whose name varies: in Pennsylvania he is usually called "Krishkinkle", but in New York he is "St. Nicholas" or "Santa Claus". The author quotes Moore's poem in its entirety, saying that its descriptions apply to Krishkinkle too. Thomas Nast immortalized Santa Claus with an illustration for the 3 January 1863 issue of Harper's Weekly. Santa was dressed in an American flag, and had a puppet with the name "Jeff" written on it, reflecting its Civil War context. The story that Santa Claus lives at the North Pole may also have been a Nast creation. 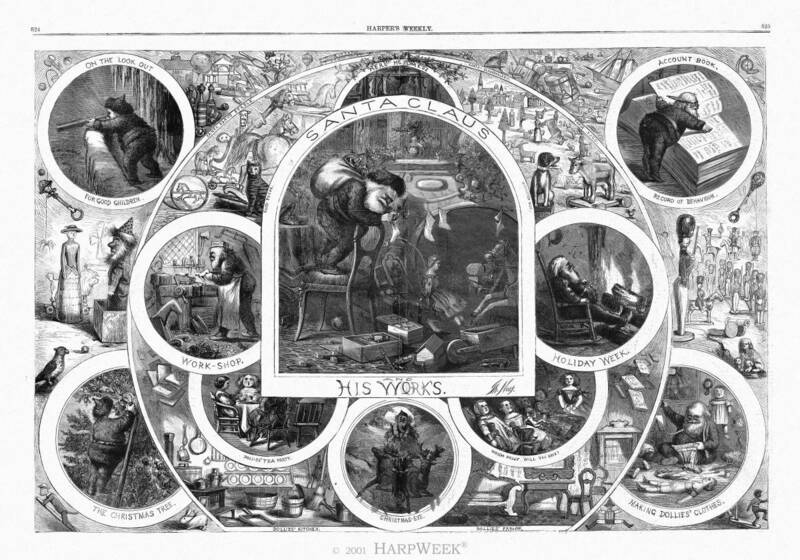 His Christmas image in the Harper's issue dated 29 December 1866 was a collage of engravings titled Santa Claus and His Works, which included the caption "Santa Claussville, N.P." A color collection of Nast's pictures, published in 1869, had a poem also titled "Santa Claus and His Works" by George P. Webster, who wrote that Santa Claus's home was "near the North Pole, in the ice and snow". The tale had become well known by the 1870s. A boy from Colorado writing to the children's magazine The Nursery in late 1874 said, "If we did not live so very far from the North Pole, I should ask Santa Claus to bring me a donkey." L. Frank Baum's The Life and Adventures of Santa Claus, a 1902 children's book, further popularized Santa Claus. Much of Santa Claus's mythos was not set in stone at the time, leaving Baum to give his "Neclaus" (Necile's Little One) a wide variety of immortal support, a home in the Laughing Valley of Hohaho, and ten reindeer—who could not fly, but leapt in enormous, flight-like bounds. Claus's immortality was earned, much like his title ("Santa"), decided by a vote of those naturally immortal. This work also established Claus's motives: a happy childhood among immortals. When Ak, Master Woodsman of the World, exposes him to the misery and poverty of children in the outside world, Santa strives to find a way to bring joy into the lives of all children, and eventually invents toys as a principal means. Santa later appears in The Road to Oz as an honored guest at Ozma's birthday party, stated to be famous and beloved enough for everyone to bow even before he is announced as "The most Mighty and Loyal Friend of Children, His Supreme Highness - Santa Claus". Santa's main distribution center is a sight to behold. At 4,000,000 square feet (370,000 m2), it's one of the world's largest facilities. A real-time warehouse management system (WMS) is of course required to run such a complex. The facility makes extensive use of task interleaving, literally combining dozens of DC activities (putaway, replenishing, order picking, sleigh loading, cycle counting) in a dynamic queue ... the DC elves have been on engineered standards and incentives for three years, leading to a 12% gain in productivity ... The WMS and transportation system are fully integrated, allowing (the elves) to make optimal decisions that balance transportation and order picking and other DC costs. Unbeknownst to many, Santa actually has to use many sleighs and fake Santa drivers to get the job done Christmas Eve, and the transportation management system (TMS) optimally builds thousands of consolidated sacks that maximize cube utilization and minimize total air miles. Many feature films have featured Santa Claus as a protagonist, including Elf, Miracle on 34th Street and The Santa Clause. In the cartoon base, Santa has been voiced by several people, including Stan Francis, Mickey Rooney, Ed Asner, John Goodman, and Keith Wickham. Many television commercials, comic strips and other media depict this as a sort of humorous business, with Santa's elves acting as a sometimes mischievously disgruntled workforce, cracking jokes and pulling pranks on their boss. For instance, a Bloom County story from 15 December 1981 through 24 December 1981 has Santa rejecting the demands of PETCO (Professional Elves Toy-Making and Craft Organization) for higher wages, a hot tub in the locker room, and "short broads," with the elves then going on strike. President Reagan steps in, fires all of Santa's helpers, and replaces them with out-of-work air traffic controllers (an obvious reference to the 1981 air traffic controllers' strike), resulting in a riot before Santa vindictively rehires them in humiliating new positions such as his reindeer. In The Sopranos episode, "... To Save Us All from Satan's Power", Paulie Gualtieri says he "Used to think Santa and Mrs. Claus were running a sweatshop over there ... The original elves were ugly, traveled with Santa to throw bad kids a beatin', and gave the good ones toys." A man dressed as Santa Claus waves to children from an annual holiday train in Chicago, 2012. New Zealander, British, Australian, Irish, Canadian, and American children also leave a carrot for Santa's reindeer, and are told that if they are not good all year round that they will receive a lump of coal in their stockings, although the actual practice of giving coal is now considered archaic. Children following the Dutch custom for sinterklaas will "put out their shoe" (leave hay and a carrot for his horse in a shoe before going to bed, sometimes weeks before the sinterklaas avond). The next morning they will find the hay and carrot replaced by a gift; often, this is a marzipan figurine. Naughty children were once told that they would be left a roe (a bundle of sticks) instead of sweets, but this practice has been discontinued. Ho ho ho is the way that many languages write out how Santa Claus laughs. "Ho, ho, ho! Merry Christmas!" It is the textual rendition of a particular type of deep-throated laugh or chuckle, most associated today with Santa Claus and Father Christmas. There is also a city named North Pole in Alaska where a tourist attraction known as the "Santa Claus House" has been established. The United States Postal Service uses the city's ZIP code of 99705 as their advertised postal code for Santa Claus. A Wendy's in North Pole, AK has also claimed to have a "sleigh fly through". Santa Claus appears in the weeks before Christmas in department stores or shopping malls, or at parties. The practice of this has been credited[dubious – discuss] to James Edgar, as he started doing this in 1890 in his Brockton, Massachusetts department store. He is played by an actor, usually helped by other actors (often mall employees) dressed as elves or other creatures of folklore associated with Santa. Santa's function is either to promote the store's image by distributing small gifts to children, or to provide a seasonal experience to children by listening to their wishlist while having them sit on his knee (a practice now under review by some organisations in Britain, and Switzerland). Sometimes a photograph of the child and Santa are taken. Having a Santa set up to take pictures with children is a ritual that dates back at least to 1918. The area set up for this purpose is festively decorated, usually with a large throne, and is called variously "Santa's Grotto", "Santa's Workshop" or a similar term. In the United States, the most notable of these is the Santa at the flagship Macy's store in New York City—he arrives at the store by sleigh in the Macy's Thanksgiving Day Parade on the last float, and his court takes over a large portion of one floor in the store. The Macy's Santa Claus in New York City is often said to be the real Santa. This was popularized by the 1947 film Miracle on 34th Street with Santa Claus being called Kris Kringle. Essayist David Sedaris is known for the satirical SantaLand Diaries he kept while working as an elf in the Macy's display, which were turned into a famous radio segment and later published. There are schools offering instruction on how to act as Santa Claus. For example, children's television producer Jonathan Meath studied at the International School of Santa Claus and earned the degree Master of Santa Claus in 2006. It blossomed into a second career for him, and after appearing in parades and malls, he appeared on the cover of the American monthly Boston Magazine as Santa. There are associations with members who portray Santa; for example, Mr. Meath was a board member of the international organization called Fraternal Order of Real Bearded Santas. Many postal services allow children to send letters to Santa Claus. These letters may be answered by postal workers or outside volunteers. Writing letters to Santa Claus has the educational benefits of promoting literacy, computer literacy, and e-mail literacy. A letter to Santa is often a child's first experience of correspondence. Written and sent with the help of a parent or teacher, children learn about the structure of a letter, salutations, and the use of an address and postcode. Canada Post has a special postal code for letters to Santa Claus, and since 1982 over 13,000 Canadian postal workers have volunteered to write responses. His address is: Santa Claus, North Pole, Canada, H0H 0H0; no postage is required. (see also: Ho ho ho). (This postal code, in which zeroes are used for the letter "O", is consistent with the alternating letter-number format of all Canadian postal codes.) Sometimes children's charities answer letters in poor communities, or from children's hospitals, and give them presents they would not otherwise receive. From 2002 to 2014, the program replied to approximately "one million letters or more a year, and in total answered more than 24.7 million letters"; as of 2015, it responds to more than 1.5 million letters per year, "in over 30 languages, including Braille ... answer[ing] them all in the language they are written". A number of websites created by various organizations track Santa Claus each year. Some, such as NORAD Tracks Santa, the Airservices Australia Tracks Santa Project, the Santa Update Project, and the MSNBC and Bing Maps Platform Tracks Santa Project have endured. Others, such as the Dallas/Fort Worth International Airport's Tracks Santa Project and the NASA Tracks Santa Project, no longer actively track Santa. 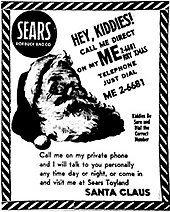 The origins of the NORAD Tracks Santa programme began in the United States in 1955, when a Sears Roebuck store in Colorado Springs, Colorado, gave children a number to call a "Santa hotline". The number was mistyped, resulting in children calling the Continental Air Defense Command (CONAD) on Christmas Eve instead. The Director of Operations, Colonel Harry Shoup, received the first call for Santa and responded by telling children that there were signs on the radar that Santa was indeed heading south from the North Pole. A tradition began which continued under the name NORAD Tracks Santa when in 1958 Canada and the United States jointly created the North American Air Defense Command (NORAD). This tracking can now be done via the Internet and NORAD's website. Many other websites became available year-round, devoted to Santa Claus and purport to keep tabs on his activities in his workshop. Many of these websites also include email addresses which allow children to send email to Santa Claus. Some websites, such as Santa's page on Microsoft's Windows Live Spaces, however have used or still use "bots" to compose and send email replies, with occasional unfortunate results. Santa Claus has partial Christian roots in Saint Nicholas, particularly in the high church denominations that practice the veneration of him, in addition to other saints. In light of this, the character has sometimes been the focus of controversy over the holiday and its meanings. Some Christians, particularly Calvinists and Puritans, disliked the idea of Santa Claus, as well as Christmas in general, believing that the lavish celebrations were not in accordance with their faith. Other nonconformist Christians condemn the materialist focus of contemporary gift giving and see Santa Claus as the symbol of that culture. 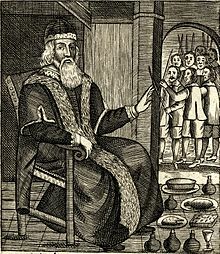 Reverend Paul Nedergaard, a clergyman in Copenhagen, Denmark, attracted controversy in 1958 when he declared Santa to be a "pagan goblin" ("en hedensk trold" in Danish) after Santa's image was used on the annual Christmas stamp ("julemærke") for a Danish children's welfare organization. A number of denominations of Christians have varying concerns about Santa Claus, which range from acceptance to denouncement. Under the Marxist–Leninist doctrine of state atheism in the Soviet Union after its foundation in 1917, Christmas celebrations—along with other religious holidays—were prohibited as a result of the Soviet antireligious campaign. 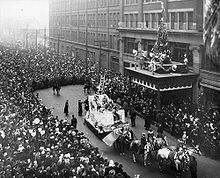 The League of Militant Atheists encouraged school pupils to campaign against Christmas traditions, among them being Santa Claus and the Christmas tree, as well as other Christian holidays including Easter; the League established an antireligious holiday to be the 31st of each month as a replacement. In the United Kingdom, Father Christmas was historically depicted wearing a green cloak. As Father Christmas has been increasingly merged into the image of Santa Claus, that has been changed to the more commonly known red suit. However, Santa had been portrayed in a red suit in the 19th century by Thomas Nast among others. A law in the U.S. state of Ohio prohibits the usage of Santa Claus or his image to sell alcoholic beverages. The law came to attention when the beer brand Bud Light attempted to use its mascot Spuds MacKenzie in a Santa Claus outfit during a December 1987 ad campaign; Bud Light was forced to stop using the imagery. Psychologists generally differentiate between telling fictional stories that feature Santa Claus and actively deceiving a child into believing that Santa Claus is real. Imaginative play, in which children know that Santa Claus is only a character in a story but pretend that he is real, just like they pretend that superheroes or other fictional characters are real, is widely believed to be valuable. However, actively deceiving a child into believing in Santa Claus's real-world existence, sometimes even to the extent of fabricating false evidence to convince them despite their growing natural doubts, does not result in imaginative play and can promote credulity in the face of strong evidence against Santa Claus's existence. Woolley posited that it is perhaps "kinship with the adult world" that causes children not to be angry that they were lied to for so long. However, the criticism about this deception is not that it is a simple lie, but a complicated series of very large lies. that tricking children into believing falsehoods interferes with the development of critical thinking. With no greater good at the heart of this lie than having some fun, some have charged that the deception is more about the parents, their short-term happiness in seeing children excited about Santa Claus, and their nostalgic unwillingness to prolong the age of magical thinking, than it is about the children. Others, however, see little harm in the belief in Santa Claus. Psychologist Tamar Murachver said that because it is a cultural, not parental, lie, it does not usually undermine parental trust. The New Zealand Skeptics also see no harm in parents telling their children that Santa is real. Spokesperson Vicki Hyde said, "It would be a hard-hearted parent indeed who frowned upon the innocent joys of our children's cultural heritage. We save our bah humbugs for the things that exploit the vulnerable." Most of them do not remain angry or embarrassed about the deception for very long. John Condry of Cornell University interviewed more than 500 children for a study of the issue and found that not a single child was angry at his or her parents for telling them Santa Claus was real. According to Dr. Condry, "The most common response to finding out the truth was that they felt older and more mature. They now knew something that the younger kids did not". In other studies, a small fraction of children felt betrayed by their parents, but disappointment was a more common response. Some children have reacted poorly, including rejecting the family's religious beliefs on the grounds that if the parents lied about the unprovable existence of Santa Claus, then they might lie about the unprovable existence of God as well. By contrast Kyle Johnson of King's College wrote, "It's a lie, it degrades your parental trustworthiness, it encourages credulity, it does not encourage imagination, and it's equivalent to bribing your kids for good behavior." ^ Krulwich, Robert. "How Does Santa Do It?". ABC News. Retrieved 25 December 2015. ^ Coke denies claims it bottled familiar Santa image, Jim Auchmutey, Rocky Mountain News, 10 December 2007. ^ "Santa's arrival lights up the Green". Archived from the original on 5 December 2012. ^ Penne L. Restad (5 December 1996). Christmas in America: A History. ISBN 9780195355093. ^ a b c d "Santa Claus: The real man behind the myth". MSNBC. 22 December 2009. Retrieved 27 December 2009. ^ "Saint Nicholas ::: People". Stnicholascenter.org. Retrieved 21 December 2010. ^ "Saint Nicholas ::: Places". Stnicholascenter.org. Retrieved 21 December 2010. ^ "Ein Verkaufsfahrer diente als Vorbild - angeblich - manager magazin". ^ Davis, Derek H. (18 November 2010). The Oxford Handbook of Church and State in the United States. Oxford University Press. pp. 334–. ISBN 9780190208783. Retrieved 20 December 2017. ^ "Sinterklaas Arrival--Amsterdam, the Netherlands". St. Nicholas Center. 2008. Retrieved 9 September 2014. ^ swissinfo.ch, Morven McLean. "Schmutzli: the Swiss Santa's sinister sidekick". SWI swissinfo.ch. Retrieved 25 December 2017. ^ Orchard, Andy (1997). Dictionary of Norse Mythology and Legend, page 187. Cassell. ^ Simek, Rudolf (2007) translated by Angela Hall. Dictionary of Northern Mythology, pages 379–380. D.S. Brewer. & Orchard (1997:1987). ^ For the wild hunt, Simek (2010:372–373). For Jólnir, see Simek (2010:180) and Orchard (1997:189). For Langbarðr, see Simek (2010:186). ^ Baker, Margaret (2007 1962). Discovering Christmas Customs and Folklore: A Guide to Seasonal Rites Throughout the World, page 62. Osprey Publishing. ^ Sirén, Ilkka. "Does Santa Claus come from Finland?". www.bbc.com. Retrieved 11 December 2018. ^ "Last Monday, the anniversary of St. Nicholas, otherwise called Santa Claus, was celebrated at Protestant Hall, at Mr. Waldron's; where a great number of sons of the ancient saint the Sons of Saint Nicholas celebrated the day with great joy and festivity." Rivington's Gazette (New York City), 23 December 1773. ^ A Woman's Wartime Journal, An account of Sherman's devastation of a southern plantation. Dolly Sumner Lunt Burge, 1988 (orig. 1927), Cherokee Publishing, Marietta GA. ISBN 0-87797-149-8. ^ "mentioning Don Foster, Author Unknown: On the Trail of Anonymous (New York: Henry Holt, 2000 : 221–75) for the attribution of Old Santeclaus to Clement Clarke Moore". Tspace.library.utoronto.ca. Retrieved 21 December 2010. ^ Kirkpatrick, David D. (26 October 2000). "Whose Jolly Old Elf Is That, Anyway? ; Literary Sleuth Casts Doubt on the Authorship of an Iconic Christmas Poem". The New York Times. ISSN 0362-4331. Retrieved 8 January 2017. ^ Snopes The Donner Party's over; on reindeer name changes. ^ "Advertisement for Harrison's Bookstore". Baltimore American Republican And Daily Clipper (p.3). 1 January 1846. ^ The article is signed "Uneda", an anagrammatic pen-name used by William Duane (1808-1882) of Philadelphia, son of William John Duane. ^ Thomas Nast, Santa Claus and His Works, 1866. The phrase "Santa Claussville, N.P." is on the curved border to the right of center, above the large word "Claus". ^ Jeremy Seal, Nicholas: The Epic Journey From Saint to Santa Claus, Bloomsbury, 2005, p. 199–200. ISBN 978-1-58234-419-5. ^ Ralph Armstrong, age 6, "A Letter From Colorado", The Nursery, 1875, vol. 18, pp. 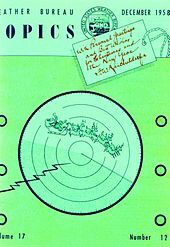 42–43. ^ "Image Gallery Santa 1931". Press Center. Coca-Cola Company. Retrieved 28 October 2011. 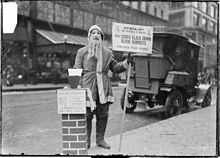 ^ The Claus That Refreshes Snopes.com . Retrieved 7 January 2008. ^ The White Rock Collectors Association, "Did White Rock or The Coca-Cola Company create the modern Santa Claus Advertisement?," whiterocking.org, 2001 Retrieved 19 January 2007. ^ White Rock Beverages, "Coca-Cola's Santa Claus: Not The Real Thing!," BevNET.com, 18 December 2006. ^ White Rock Beverages, "Coca-Cola's Santa Claus: Not The Real Thing!," BevNET.com, 18 December 2006 . Retrieved 19 January 2007. ^ thumb|Santa Claus on the 1902 cover of Puck magazine, thumb|Santa Claus on the 1904 cover of Puck magazine, thumb|Santa Claus on the 1905 cover of Puck magazine. ^ Susman, Tina (30 October 2011). "Claus and effect: The ultimate Santa school". Los Angeles Times. ^ "High Five! Top Five! – Bizarre Santa Claus Cameos in Comics by Robert Bazz, December 13, 2010". High Five! Comics. Retrieved 25 February 2011. ^ "Guiness [sic] World Record Santa Claus Costumes | WebPhotoBlog | imagini, fotografii, pictures, poze, images". Webphoto.ro. 30 November 2009. Retrieved 29 September 2010. ^ Walsh, Joseph J.. Were They Wise Men Or Kings? : The Book of Christmas Questions. Westminster John Knox Press, 2001. ISBN 0-664-22312-5. ^ "Canada Post - Newsroom - Letters to the Editor". 24 April 2008. Archived from the original on 24 April 2008. ^ "Беловежская пуща - Фотоэнциклопедия Беларуси". ^ Allegrini, Elaine (15 November 2008). "James Edgar's Santa Claus—the spirit of Christmas". The Enterprise. Brockton, Massachusetts. Retrieved 29 November 2009. ^ "New Santa clauses introduced". BBC News. 9 December 2002. Retrieved 23 May 2010. ^ Connolly, Kate. "Swiss Santas are banned from sitting children on their laps". The Daily Telegraph. Berlin. Archived from the original on 20 July 2006. Retrieved 23 May 2010. ^ "A Visit from St. Nick". Squareamerica.com. Archived from the original on 24 December 2010. Retrieved 21 December 2010. ^ DeMara, Bruce (25 November 2013). "Autistic kids get quiet time with Santa at malls". Toronto Star. Retrieved 21 December 2013. ^ "Canadian malls offer quieter, calmer visits with Santa for kids with autism". CTVNews. 24 November 2013. Retrieved 21 December 2013. ^ Edward B. Colby (3 December 2009). "Town in the spirit: Dedham Square to be filled with song, shopping". Dedham Transcript. Archived from the original on 21 July 2011. Retrieved 13 November 2010. DEDHAM—The fifth annual Dedham Square Holiday Stroll this ... At 6 p.m., Jonathan Meath – better known as Santa JG, who performs with the Boston Pops – will entertain children and families at Cafe Video Paradiso with a sing-along with Santa. "We booked him months ago because we knew that he's in demand this time of year," Haelsen says. ^ Mary Ann Georgantopoulos (23 December 2007). "Miracle on Mass. Ave.: City Santa takes suit seriously". The Boston Globe. Retrieved 13 November 2010. Santa Claus is coming to town. More accurately, he's from town—Cambridge that is. Jonathan Meath is the perfect fit for a Santa. ^ a b c d "Santa Claus receives more than six million letters annually and growing, 20 Dec 2007". Asian Tribune. Retrieved 12 December 2010. ^ a b c d e "No small job for postal elves, 15 Dec 2010". Universal Postal Union – UPU. Retrieved 17 December 2010. ^ 15 November 2011 No Comments (15 November 2011). "Operation Santa Claus at James Farley Post Office 2012 | Operation Santa Claus – Santa's Blog". Archived from the original on 28 November 2011. Retrieved 10 December 2011. ^ "Santa Mail - Letters to Santa". Retrieved 25 November 2014. ^ "France answers the most Santa letters, 21 Dec 2007". xmas.co.uk. 21 December 2007. Retrieved 12 December 2010. ^ "Canada Post – Holiday – Santa's Corner". Canadapost.ca. Retrieved 21 December 2010. ^ ": LA POSTE | Père Noël". Laposte.fr. Archived from the original on 20 July 2011. Retrieved 21 December 2010. ^ "Father Christmas's French office open, 18 Nov 2010". The Connexion. Retrieved 12 December 2010. ^ "Send a letter to Santa | New Zealand Post". Nzpost.co.nz. Archived from the original on 21 January 2012. Retrieved 21 December 2010. ^ "NZ Post to tighten net for Santa, by Alexis Grant, 30 Nov 2004". New Zealand Herald. 30 November 2004. Retrieved 12 December 2010. ^ "Employment Opportunities – Traditions". Canada Post. Archived from the original on 8 April 2008. Retrieved 21 December 2010. ^ "Time to write to Santa!". Canada Post. 19 November 2015. Retrieved 2 August 2016. ^ "Write to Santa and he'll write you back!". Canada Post. 5 November 2015. Retrieved 2 August 2016. ^ a b 'Letters to Santa Claus'. (2000). In The World Encyclopedia of Christmas. Gerry Bowler, Editor. Toronto: McClelland & Stewart Limited. pp. 131–132. ^ "Christmas letters to Santa". Royal Mail. Retrieved 27 December 2013. ^ "About this site – Embassy of Finland, Beijing – Consulates General of Finland, Shanghai and Guangzhou : Current Affairs". Finland.cn. 16 May 2007. Retrieved 21 December 2010. ^ "Beijing Post Office". Beijing Your Way. Retrieved 21 December 2010. ^ "Beijing International Post Office". Vip.fesco.com.cn. Retrieved 21 December 2010. ^ "Expat kids get the chance to connect with Santa, November 17, 2010 by Todd Balazovic and Li Jing (China Daily)". China Daily News. Retrieved 12 December 2010. ^ "Say hello to Santa Claus, November 24, 2010 by Zhao Hongyi". Beijing Today. Archived from the original on 1 December 2011. Retrieved 12 December 2010. ^ "Santa 2010 website by Airservices Australia". Mirror.airservicesaustralia.com. Archived from the original on 20 December 2010. Retrieved 21 December 2010. ^ "Safe Travels Santa! We will Be Watching, 19 Dec 2005". NASA's Canberra Deep Space Communications Complex. Archived from the original on 16 February 2011. Retrieved 4 December 2010. ^ "New technology to map Santa's flight, 24 Dec 2009". The Observer. Retrieved 5 December 2010. ^ "Welcome to The North Pole – A Virtual Earth 3D Experience!". Today.msnbc.msn.com. Retrieved 21 December 2010. ^ "Tracking Santa with Bing Maps, by Chris Pendleton, 24 Dec 2009". Microsoft. Archived from the original on 1 January 2010. Retrieved 5 December 2010. ^ "DFW airport unveils Santa Tracker website, 18 Dec 2006". PegNews wire. Archived from the original on 26 August 2011. Retrieved 4 December 2010. ^ "DFW Airport's 'Santa Tracker' Is Operational, by BJ Austin, 24 Dec 2009". PBS KERA. Retrieved 4 December 2010. ^ "From NORAD Santa Tracker To Twitter: Santa Tracking For Christmas Eve 2009, by Danny Sullivan, 23 Dec 2009". Search Engine Land. 24 December 2009. Retrieved 5 December 2010. ^ "Here Comes Santa Claus! Watch it on the Web!, 24 Dec 2005". WRAL.com – Raleigh, Durham, Fayetteville – North Carolina's TV Station website. Archived from the original on 8 August 2011. Retrieved 4 December 2010. ^ Gurnon, Emily (23 December 2014). "How A Sears Typo Led To NORAD's Santa Tracker". Forbes. Retrieved 24 December 2014. ^ "Norad Santa Tracker: Christmas tradition began with a wrong number". CBC News. CBC. 24 December 2014. Retrieved 24 December 2014. ^ "SantaWatch: Hunt for Santa to Include Clues from the International Space Station, by Dreamtime, 18 Dec 2000". Dreamtime. Retrieved 11 December 2010. ^ "Keep track of Santa thanks to NORAD, by WKTV News, 24 Dec 2009". Dreamtime. Archived from the original on 27 September 2011. Retrieved 11 December 2010. ^ "Microsoft pulls plug on potty-mouth Santa, by John Fontana, 4 Dec 2007". Network World. Archived from the original on 13 October 2012. Retrieved 9 December 2010. ^ "For a Jolly Good Time, Chat With Santa on Windows Live Messenger, 13 Dec 2006". Microsoft. Retrieved 9 December 2010. ^ "NORAD Tracks Santa – Citation – Space Certification Program as a Corporate Patron Level Partner in the Certified Imagination Product Category, December 2007". Space Foundation. Retrieved 31 December 2009. ^ "Hi-tech helps track Santa Claus, December 24, 2008". BBC News. 24 December 2008. Retrieved 31 December 2009. ^ "You'd Better Not Pout! Booz Allen Supports NORAD to Track Santa's Approach This Year, December 1, 2010 by Booz Allen Hamilton". Booz Allen Hamilton. Archived from the original on 10 December 2010. Retrieved 1 December 2010. ^ Kippenberg, Hans G.; Kuiper, Yme B.; Sanders, Andy F. (1 January 1990). Concepts of Person in Religion and Thought. Walter de Gruyter. p. 363. ISBN 978-3110874372. ^ Bowler, Gerry (27 July 2011). Santa Claus: A Biography. Random House. ISBN 978-1551996080. ^ "When Christmas Was Banned – The early colonies and Christmas". Archived from the original on 8 January 2010. ^ "History – Ten Ages of Christmas". BBC. 13 March 2005. Archived from the original on 13 March 2005. Retrieved 21 December 2010. ^ Clar, Mimi (October 1959). "Attack on Santa Claus". Western Folklore. 18, No. 4 (4): 337. JSTOR 1497769. ^ Santa Claus: The great imposter, Terry Watkins, Dial-the-Truth Ministries. ^ To Santa or Not to Santa, Sylvia Cochran, Families Online Magazine. ^ Eddy, Mary Baker (1925). Miscellany, p. 261, in Prose Works other than Science and Health. Trustees under the will of Mary Baker G. Eddy, Boston, USA. ^ Echo of Islam. MIG. 1993. In the former Soviet Union, fir trees were usually put up to mark New Year's day, following a tradition established by the officially atheist state. ^ Luzer, Daniel (26 November 2013). "What a Real War on Christmas Looks Like". Pacific Standard. Retrieved 12 November 2014. There were several anti-religious campaigns, the most dramatic of which occurred in the 1920s. According to a piece published by the School of Russian and Asia Studies: In 1925, Christmas was effectively banned under the officially atheist Soviets, and was not to return to Russian lands until 1992. The New Year celebration usurped the traditions of a Christmas Tree (Ёлка), Santa (known in Russian as "Дед Mopoз" or "Grandfather Frost"), and presents. In the Russian tradition, Grandfather Frost's granddaughter, the Snow Maiden (Снегурочка), always accompanies him to help distribute the gifts. Elves are not associated with the holiday. The state prohibited people from selling Christmas trees. There were even festivals, organized by the League of Militant Atheists, specifically to denigrate religious holidays. Their carnivals were inspired by similar events staged by activists after the French Revolution. From 1923 to 1924 and then again from 1929 to 1930 the "Komsomol Christmases" and Easters were basically holiday celebrations of atheism. ^ How St. Nicholas Became Santa Claus: One Theory, interview with Jeremy Seal at the St. Nicholas Center. ^ "In defense of Santa Claus". Archived from the original on 26 December 2007. Retrieved 7 September 2016. , Carol-Jean Swanson, Mothering, Fall 1992. ^ "Better Watch Out, Better Not Cry". Archived from the original on 20 January 2007. Retrieved 13 December 2007. CS1 maint: BOT: original-url status unknown (link), Hilda Hoy, The Prague Post, 13 December 2006. ^ "Nast, Thomas: "Merry Old Santa Claus" – Encyclopædia Britannica". Britannica.com. Retrieved 11 June 2013. ^ "Spuds Can't Promote Beer Dressed as Santa". Associated Press. 2 December 1987. Retrieved 23 November 2012. ^ a b Johnson, David Kyle. "Say Goodbye to the Santa Claus Lie". Psychology Today. Retrieved 12 December 2018. ^ a b c d e f Lowe, Scott C., ed. (2010). Christmas – Philosophy for Everyone: Better than a Lump of Coal. Malden, Mass. : Wiley-Blackwell. pp. 143–147. ISBN 9781444330908. OCLC 539086689. ^ a b Do You Believe in Surnits?, Jaqueline Woolley, The New York Times, December 23, 2006. ^ a b Vines, Gail (2011). "The Santa Delusion". New Scientist. 210 (2809): 29. Bibcode:2011NewSc.210Q..29M. doi:10.1016/S0262-4079(11)60920-2. Retrieved 12 December 2018. ^ a b "How to deal with the 'is Santa real?'". The Dominion Post. Retrieved 7 November 2011. ^ "Lying To Kids About Santa Can Erode Their Trust, Psychologists Say". Vocativ. 25 November 2016. Belk, Russell. 1989. "Materialism with the modern U.S. Christmas". In Interpretive Consumer Research, ed. by Elizabeth C. Hirschman, Provo, UT: Association for Consumer Research, 75–104.